Elevated CO₂ levels have been shown to kill insect pests in sealed containers (Navarro 2006). Most insects in stored seeds are killed when the atmosphere in the room or container is comprised of 60% or more CO₂. Elevated CO₂ levels have little or no adverse effect on the germination (Gupta et al. 2014; Navarro et al. 2012) of stored seeds. Most farmers would not have access to CO₂ cylinders/tanks, but perhaps they could generate their own CO₂ with yeast, sugar and water. Is CO₂ generated in this way effective against insects that damage seeds? 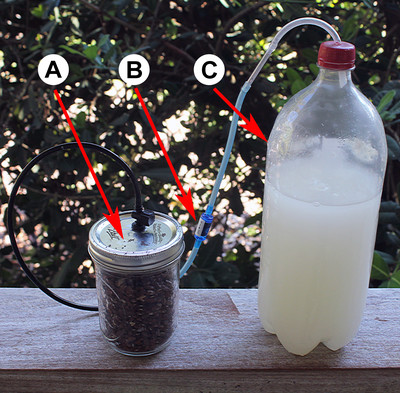 Tim Motis has also experimented briefly with a CO₂ generator to control bruchids in cowpea seeds. See Figure 1 for a photo of the components used. Select a drill bit slightly smaller than the diameter of polyethylene airline tubing. Drill a hole into the lid of a plastic bottle and push several centimeters of tubing through the hole. Fill a 2-L bottle container about two-thirds of the way full with warm water. The end of the airline tubing, inside the bottle, should be well above the level of the water. Pour 1 to 2 cups (237 to 473 ml) of sugar into the water and then shake it up to completely dissolve the sugar; NOTE- the sugar will dissolve faster in warm than cold water. There should not be any sugar settling to the bottom of the container. Screw the lid (with tubing in it) tightly onto the bottle of yeast/water. Connect the other end of the airline tubing to the lid of a mason jar; some creativity is needed to make a leak-proof connection. Check for leaks. After about 30 minutes, press the the sides of the water/yeast container. They should feel firm, a sign of pressure build-up as CO₂ is being generated. You will also see some foam produced at the top of the container. Place a few drops of water around the area where the tubing connects to lid of each container. Any bubbles indicate leaks. If necessary, use glue to ensure leak-proof connections. Make a very tiny hole for gas to exit as CO₂ is generated. To do this, Motis made a hole in the jar lid with a hammer and small nail, covered the nail-hole with tape, and then punctured a portion of tape over the nail hole with a needle. As CO₂ is generated, CO₂ and/or oxygen escapes through the needle-hole in the tape. Since CO₂ is constantly being generated, it builds up in the seed container. Following the above steps, using 0.5 L (2 cups) of sugar, CO₂ was generated over a period of about two weeks, with all cowpea bruchids being killed. How can you tell if CO₂ is being produced? Place a drop or two of water over the tiny hole in the mason jar lid. If you see bubbles, CO₂ is still being generated. What ratios of sugar, water, and yeast to achieve optimum results? Adding more yeast speeds up the production of CO₂. Doing so also uses up the sugar faster, reducing the duration of CO₂ production. Using less yeast extends the duration, but reduces the rate/speed, of CO₂ production. Adding more sugar extends the duration of CO₂ generation, but there is only so much sugar that can dissolve in a given volume of water (e.g., 0.5 L [2 cups] of sugar is at or near the maximum for 2 L of water). How much time is needed, with any given method or recipe used, to replace oxygen with CO₂ in a container? Is there a simple way to determine when the oxygen has been replaced by CO₂? Once the CO₂ replaces all or most of the oxygen in a container, can the container be sealed, reducing the time over which CO₂ needs to be generated? If that works, it would reduce the amount of sugar needed. How long do various species of insects need to be exposed to CO₂ to control larvae, adults and eggs? A literature review will show what insects have been studied already.